As staff of the OB Rag, we are part of a wider network of progressive citizen journalists and bloggers that include those of the San Diego Free Press – our sister online media partner. 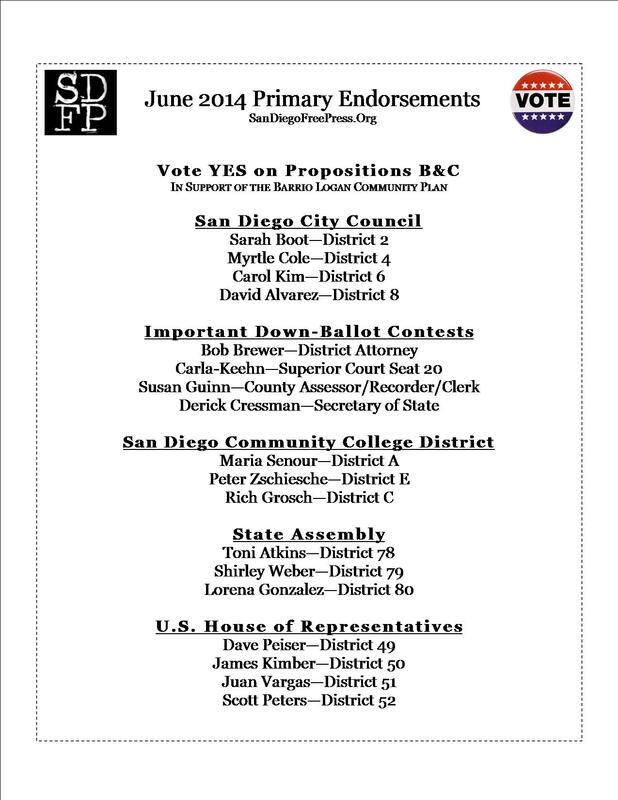 The OB Rag then joins the following endorsements for the June 3rd Primary election. We met, we debated and we agreed, mostly. Here are the people we’d like you to vote for in the June 2014 primary. The first decision we made was to limit the number of endorsements. We agreed that local races were more important, with the exception of a nod to Derick Cressman for Secretary of State because of his leadership in fighting the influence of Dark Money in California elections. You can see all the SDFP stories on this upcoming election here. Once again, I urge a vote for homegrown, experienced, registered Independent candidate MITZ LEE for City Council District 6. Most OBecians won’t be voting in the district elections for District 6, but there may be Rag readers up in Clairemont or Mira Mesa. If you want representation from a person rather than a political party plug-in, vote for MITZ LEE. I’ve known Mitz for almost 20 years: she is local –not a carpetbagger– intelligent, hard-working, collegial and she’s in the race to serve her community, not the special interests who are pouring money into GOP and Dem political machines on behalf of Kim and Cate. I agree that Mitz Lee would be a welcome addition to the Council. Even thought she was not my representative on the School Board, she was always very helpful, positive and respectful of taxpayers and citizens. Looks like progressives to me. Scott Peters is a commie progressive? He’s closer to Republican. Voting is the least that you can do today. Almost all the wrong people, and wrong answers, won. Very depressing.